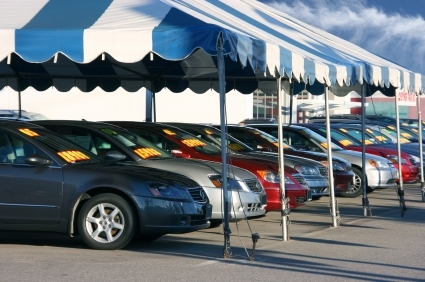 Selling your car can be a time-consuming, laborious process. There are advertisements to take out, money to spend and hours with potential buyers to muddle through, but it doesn’t have to be all bad. We’ve worked up five quick steps to take your car from your burden to someone else’s pride and joy. After you've prepped your car for sale, start by dusting off the digital camera and devoting a solid day toward squaring away the details necessary to get your used wheels to market. Determining exactly how much to ask for your vehicle is a tricky first step. Ask too much and you could scare away potential buyers. Ask too little and you could put yourself in a tough spot financially when it comes time to pick up your next ride. DriverSide has a great tool to help you figure out a good starting point. Simply enter your vehicle’s year, make, model and mileage and we’ll provide you with a national average price for that particular car. Don’t go slapping that number on your car’s windshield just yet. There are many factors to sift through when determining your vehicle’s worth besides its mileage. Is it particularly well maintained inside and out? Has it recently been painted? These are things that can bolster your asking price. Of course, the flip-side of that coin means that if there are any nasty issues with your ride – like a rough interior, scratched paint or rusted sheet metal – the price should fall below the average. Where your vehicle is located tends to have an impact on what you can ask for it, too. If you live in an area where your particular vehicle is common, odds are there will be plenty of people out there looking to sell similar cars. That means your price should come down some to be competitive. A good way to get a feel for what you should ask is to look at similar cars for sale in your area. Evaluate their condition, compare it to yours and adjust the price accordingly. It’s also important to build in a little comfort space in your price. That can range from a couple of hundred dollars all the way up to $500. This allows the buyer to “talk you downâ€ somewhat and lets you get the most possible out of your car. There are as many ways to advertise your vehicle as there are cars on the road, but some are more effective than others. Far and above the easiest method is simply to stick a ‘For Sale’ sign in your car’s window and park it where as many people as possible will see it. While not exactly time consuming, the odds of someone driving by who’s actually interested in purchasing your vehicle is pretty slim. Instead, it helps to show off your set of wheels where interested buyers usually look. Typically, that means classified ads or online services. Before you settle on which route you plan to take, it’s important to take a good photo of your car. Pictures sell cars, so take the time to get a good quality set of snapshots of your ride before continuing. As a general rule of thumb, most cars photograph best as the sun is coming up or going down, not in midday. Find an attractive, suitable backdrop and orient the car so you can take a picture with the sun shining on the side you wish to photograph. You may have to move it around several times, but it will be worth it in the end. Don’t be afraid to use your camera’s flash for the interior, either. Remember – the more photos you take, the more you’ll have to choose from when it comes time to place your ad. It goes without saying that the more you advertise your vehicle, the better your chances of finding a buyer. That said, putting your car out there in multiple venues can get pricey. Most newspapers charge by the word and don’t allow for a color photo of your car. If they do, the quality isn’t all that great. Fortunately there are online options that allow for near limitless descriptions of your vehicle and plenty of high quality photos. Right now eBay Motors will allow you to list your vehicle for free, only charging you if the car gets a bid. Likewise, you can list your vehicle free of charge in DriverSide’s used car section – exposing your ride to plenty of interested parties all over the country. If you do decide to place an online ad, it’s important to review your ad’s text before submitting it. Make sure to check for any spelling or grammatical errors in order to produce the most professional product possible. Avoid slang or exclusive terms that may turn off buyers. Remember, you’re trying to appeal to the largest audience possible. Hopefully, interested parties will begin contacting you about your car shortly after you start advertising. Potential buyers will likely want to come see your vehicle. If they like it enough, they’ll probably want to test drive it. Be as accommodating as possible and be prepared to spend a good chunk of time answering questions. Provide your potential customer with a copy of your vehicle’s AutoCheck report so they can see the vehicle’s history for themselves. By now, you should have taken the car by a mechanic anyway, but it’s possible your buyer might want to bring the car by their own shop. Don’t worry, it’s a normal request. If you’re uncomfortable with allowing the buyer to have your car for a period of time, don’t hesitate to offer to go with them or to take the car yourself. A smart buyer will have plenty of questions about the car they’re buying. If you don’t know the answer, don’t feel pressured to lie. Just admit that you don’t know the answer and refer them to your mechanic to clear up any gray areas. After all, your buyer is on the verge of spending a large chunk of money. They have the right to know as much as possible about your car. Above all else, trust your gut. If something in the back of your mind is telling you not to do business with this person, don’t. If anything seems suspicious or problematic about the individual looking your car over, simply hold out for another buyer. There are too many people out there looking for a good used car to bother with someone who’s going to cause you headaches. Be prepared for a little give and take here. Your buyer will likely provide you with a laundry list of things he or she doesn’t like about your car. Don’t feel insulted, it’s just the best way they have to get you to bring down the price of the car. Work with them as much as possible, but if they offer too little, don’t feel obliged to come down to their level. If your car is appropriately priced, someone out there will want to buy it. Also, don’t get discouraged if your potential buyer says they’ll think it over. They don’t have to buy the car right away, and odds are they’ll come back to see the car again – likely with a higher offer. You might have to do the same song and dance with a number of potential buyers over the next few weeks. At this point, it’s important to remember to treat each person who comes to look at your car like they’re the first. Don’t gloss over any details or leave anything out. It may be tiring, but it’s the best way to ensure you sell your car for as much as possible. When the right person comes along, they’ll offer you a price within reason. You’re completely within reason to ask for a cashier’s check or straight cash. Not every personal check out there is trustworthy. If your buyer complains, show them the door and start all over. Once you’ve worked through all the pictures, postings, questions and payments, there’s just a little more to do. Typically, the buyer pays all tax and title fees, but you may want to make that clear to the person purchasing your vehicle beforehand. You’ll probably have to spend some time at your local department of motor vehicles with your buyer to swap out the title and license plates, too. Local laws vary widely from state to state and county to county, so make sure you’re in compliance with any legislation at the time. Spending a little bit of time at your state’s DMV website will go a long way to avoiding any headaches on the day of the sale. The last thing you want to do is have to track down your buyer months later when you realize you missed a form or fine. That brings us to our last point. Make sure you exchange contact information with your buyer. This is particularly useful if you locate an otherwise forgotten piece of paperwork, a spare key or anything else that goes with your vehicle later down the line. It’s also goes a long way toward your buyer’s peace of mind when you offer up your info in case they need anything.